Divorce is heartbreaking for parents and kids. Use these tips to make it easier on everyone. One of the most heartbreaking parts of divorce is telling your kids. You don’t want to hurt your kids, but they need to know what is happening. 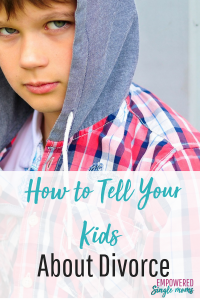 In the video below I share some important things to remember when telling your kids about divorce. After the initial shock, your children may actually appreciate your decision to divorce. Although they probably do not want their home to change, they want both of their parents to be happy and they want the fighting to stop. Minimize the painful effects of divorce on kids with these 7 tips. They are probably already aware that home is not a happy place. With some careful considerations, you can minimize trauma. You and your children can move forward into lives that are better for everyone involved. You can read the complete post on Your Tango where I was featured.